Year 5's have been writing newspaper articles set in 1976 about violent clashes between black demonstrators and police during the times of apartheid in South Africa. Year 5 Red and Blue - write out your articles to share with the rest of the school. Perhaps other pupils have a reflective comment to make and will state what they like about one of the articles. Black people not wanting to learn Afrikaans so goes on a March Yesterday a school of angry youthswent on a March then got shot dead by police.Youth protested in complaint of the compulsory use of Afrikaans was rejected by the black youths, they planned a March to represent their refusal of learning the language. Hoping that people would think the same way and notice the they took to the streets. As the police approached,they tried to block the roads and stop the March. The youths went past feffiny primary school and walked past such as Soweto. The protesters were annoyed about the police so they threw bottles,stones and other missiles. When a eye witness saw the March and shuouted "the blacks are right". The police have been hit by the missiles so they retaliated by shooting into the crowd. Yesterday black youths started to protest about the compulsory use of Afrikaans so they went around the townships os Soweto past phenfeni primary school were 1 million people live they had a banner that said " down with Afrikaans" 12 people had been reported dead in this series of violent clashes. The police blocked the road so they can't go. But the protesters went the opposite way. As the protesters started throwing bottles and stones and other missiles the police retaliated and fired shots into the crowd. An eyewitness said 12 people dead from the police. Are any more police going to kill people? I wonder what would happen if the apartheid stops? Will the apartheid ever be over? Will the apartheid come back? Yesterday, 12 black demonstrators have reported dead following dead violent clashes in the protest.Many more police were dragged into the protest.The reason why they have started the protest because in school,they did not want to learn Afrikaans.It was around lots of townships and reached th phefeni school. There was 10,000 angry black youths that have started the protest yesterday evening. They have started a protest so that they couldn't learn Afrikaans. They went on a public road so that they could rare awareness. Everything was going perfect,but they have came to the end. The violent clashes between angry black youths and the police. The violent clashes has begun. The angry youths threw stones and bottles at the police, the police could not take it anymore. The police shooter all around the crowds. As a result, 12 people have died. The ambulance were unable to get the injured because of the crowd. What will happen next? I think that it was not fair because the black people had the chance to over throw the government. How would you feel if you feel if you had lost such a such to overthrow the government? I would feel lots of shame because I would do it for my country. As the prime minster Vorster said "this government will not be intimidated" or how could you start a March? Also how would you feel if you lost your friends in such a protest? I would keep on trying and bring more people into the demonstration and always try to overthrow the government if they are doing the wrong thing. Well done Abdi but some of them did want to learn Afrikaans. Yesterday, what started as a march outside Pheleni school became a violent clash between black demonstrators and police, with fires reaching Soweto to Alexandra. This all happened because of Afrikaans being made to be the main language in schools. Angry youths live rounds were marching in the streets however it didn't take long before the police noticed them. Although the youths knew that protesting wouldn't change much they carried on, when the police arrived the protesters began throwing stones and other objects. The police responded by firing live rounds '' this happened because the police think they rule Soweto.'' The known amount of deaths is 12 however the final number of dead may be much higher because the paramedics couldn't get through the raging crowds no matter how hard they tried. Two white men were reported dead, an eye witness said that the two mean were speeding and they got caught in the crossfire between the protestors and the police. A police spokesperson has reported that when the protest became out of control, they had to call in more police to help protect the shops and buildings. Many killed, many arrested yet the youths still protest to their heart's content, even though the police try to take control of the situation. When Prime Minister Vorster said "The government will not be intimidated" an eye witness replied that "what lies ahead for this country's laws nobody knows but I hope we will get a new president that changes the law." Only yesterday 10,000 people including some people from Phefeni primary school bolted on a march. to stop the compulsory teaching of Afrikaans. 12 people ended up dead due to a clash between police and protesters. Eventually ,when things got out of hand , someone called the police. When the police arrived things had changes, all the young protestors threw bottles and stones at the police. The police then retaliated firing shots at the protestors. 12 Protestors ended up dying. Prime Minister Vorsrter said "The government will not be intimidated". My opion is that when there is a protest there shouldn't be shots fired. 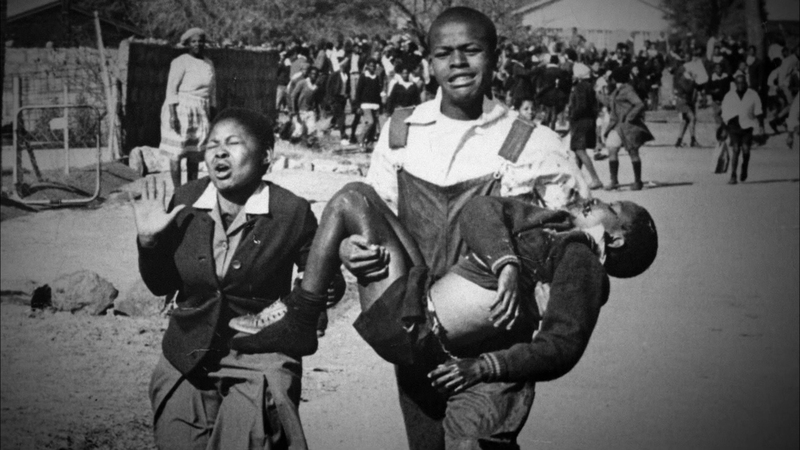 10,00 black youths began a march in soweto, carrying banners and slogans that said "down with Afrikaans".People did this to seek the police's attention.The march began in Phefeni primary school and continiued in Jo'burg town ships. THE protest unfourtunatley this had a tradgic end when police reataleated by shooting. Black youths threw stones and bottles and other missiles at the police. Armed police arrives shooting into the crowds. People retaliated by throwing stones, bottles and other missiles. Also Police blocked off roads. 12 people died because of the police shooting and dealing with it the wrong way. People reported that the police destroyed their protest and they should have let them stand up for their rights. yesterday in Soweto at least 12 people were killed in a violent clash! between young black youths and the government! Angry black trews stones and bottles at police to protest against learning Africans. The ambulance could not see what was going on beacose there was a big crud suddenly,2 white men and 2 black children where killed violently,but it was thought there was more people killed then 4. After 2 days,suddenly the clash,violently "stopped". Last Week, in the township of Soweto,12 people have been reported dead in a violent clashes between black demonstrators and police, over the compulsory use of Afrikaans in schools. Angry youths threw stones and bottles and the police responded by shooting live rounds into the crowd. The violence spread from the outskirts of Soweto to the white suburbs in Alexandra. 10,000 students were holding barriers saying 'Down with Afrikaans'. What started of as a march, it suddenly turned into a violent protest. A police spokesperson reported that the violence spread from one end of the city to another and that more police had to be drafted in. At least 12 people have died in this violent protest. Paramedics say they were unable to get through the crowd and they reported that the number of deaths may be higher. 2 men have been reportedly shot dead because they tried to run over police. 2 black children and 2 white men have been killed in this chaotic protest. More police came to control the situation. After what seemed like days of protesting many people were arrested however the protest still went on. Prime Minister Vorster said ''This government will not be intimidated .'' An eyewitness said 'This is the worst thing to happen in Soweto. My family is horrified.' It was reported that black students want to learn english in school. What effect will this bring on black people? Another spokesperson reported that there might have to be new laws for black people, seeing as they are disturbing white students learning. Yesterday, at the town square of Soweto at least 12 people were killed in a violent clash. pupils from Phefeni school threw stones and bottles at the police. They were protesting against the use of compulsory. Many days later when the prime minister found out what happened he responded by stating ''this government will not be intimidated. Yesterday, angry youths started a march in Soweto. Unfortunately the march turned into a violent protest. Students didn't want to be taught Afrikaans in school as they wanted to learn a language they already spoke. Violence escalated youths threw bottles and stones.Sadly 12 protesters were killed by police throwing missiles into the crowd. Ambulance drivers say that they couldn't get through the large crowd so more people were found dead. 10,000 people were holding up banners saying "Down with Afrikaans". Black protesters hated the apartheid as they weren't being treated properly and wanted to live equal. Many people have been arrested. After days of protesting, police are still trying to control the situation. People who have been arrested still try to fight for their rights. It is unclear what lies ahead of the apartheid. yesterday a group of angry youths marched in Soweto the angry youths were protesting the protesters were spotted by polices .It started in Soweto to Alexandra. They were protesting because they didn't want to learn Affrikaans in school. It started of as a peace full protest as people were shouting "Down with affrikaans" clames steve who iwiness from his window. Once the police came the protest went another direction The protest started throwing stones and bottles at polices and the police started throwing fire at protesters and at least 12 people were killed and 2 white man were shot dead and even 2 white children were also shot dead bombs and fir were throw at overs this severgaition was in Soweto to Alexandra polices were trying to get throw because there was a big crowd not even ambulance could get through the crowd.